Our old time straw dispenser is perfect for all your beverage needs. This elegant straw holder is just like the ones in an old fashioned soda shop. Lift the lid and the straws fan out for easy access. 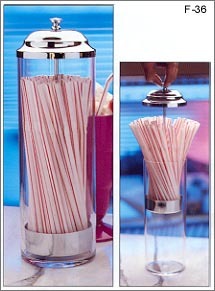 Just pick a straw for your chocolate milk, cherry coke, raspberry iced tea, milk shake or other favorite drink. Crystal clear break resistant acrylic body. Chromed steel lid & tray. Comes complete with 36 flex straws. Approximately 10 3/4" high & 3 1/2" wide. My son and daughter in law and kids like to use straws when drinking colored beverages to keep the color off their teeth and I needed a handier way to keep the straws. This is exactly what I pictured and exactly what I wanted. I like the plastic too. It's safer for little kids!! Thanks. Nice product. Was just what I wanted. I only wish that it were a bit deeper as straws need to bend for top to close. Unbendable straws do not seem to fit well. bought straw dispenser-- smoothy flex 10" straw fits if straw is flexed, then the straw can slip in the dispenser + top lid will can be closed. This is a pretty good quality product. It seems well constructed. It doesn't fit the normal straws you get at the grocery store, however. You have to find shorter ones or cut regular ones down. That may limit its usefulness for my family. The dimensions listed on the product description do not reflect a half-inch gap at the bottom where the inner part hangs above the base. I have to bend the usual flexi-straws I buy for the kids to get them to fit. Worked great for our ice cream themed party.. arrived quickly and reasonably priced. This went along great with our 50's theme party for graduation. I was glad to see how sturdy it was and that it came so quickly. Thanks for having such a neat item to add to our party!